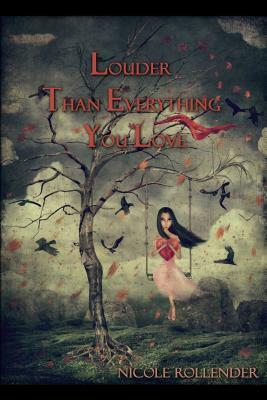 In Nicole Rollender’s debut poetry collection, Louder Than Everything You Love, the female body is damned and sanctified, playing host to the self and others. These others, whether it be a lover, child, mother, or grandmother, intertwine through the body in visceral ways—through desire, pregnancy, or generational pain and grief. Nicole Rollender is a widely-published Literary Mama contributor, with poems from this collection appearing in such journals as Word Riot, Luna Luna magazine, THRUSH, The Adroit Journal, among many other notable publications. Poems from this collection also appeared in the chapbook Absence of Stars from dancing girl press and Bone of My Bone, which won the 2015 Blood Pudding Press Chapbook Contest. Recordings of Rollender reading poems from the collection, such as the poem "Wearing a Dead Woman’s Hair" are available for listening on her SoundCloud account, which also features the cover art from the collection. The collection’s opening (and Pushcart Prize nominated) poem, "Eating Honey" sets the foundation for these inextricable ideas of body, family, love, religion, and superstition through the speaker’s desire to be something else. In this poem packed with physical bodies that lean toward destruction or death, the speaker encounters a dead, bloated cow: "I may have said I wanted to be her, / because of how quiet that kind of sleep is— / your breath curled inside a labyrinth." Even the act of eating honey is marred by the speaker’s desire to become honey, "my life siphoned from hundreds / of open flowers, regurgitates in a bee’s / sweet mess, when a baby still hadn’t unsealed my body." What the speaker attempts to reclaim is never wholly hers. Rather, a lingering and poignant desire frames poems that must reckon with trauma, grief, and the difficult work of remembering, even in the face of the pain that remembering might cause. From its onset, Louder Than Everything You Love is steeped in Catholicism and Catholic traditions as part of remembering the dead. The most obvious nod to these traditions are a series of psalm poems that conclude and begin each of the collection’s three sections. In tightly packed prose block form, with sentences broken by colons in one long, tangling sentence, these poems give instructions for how to read the psalm/poem, drawing clear parallels between prayer and poetry. In "Psalm to Be Read While Combing My Daughter’s Hair," the speaker explores the relationship between self and daughter: "her shining need makes gardenias bloom from my mouth: her index fingers lift into the steeple: but this isn’t a building made of wood, it’s her metacarpal bones . . . ." The daughter’s body, while being likened to a church, is decidedly a human body, made of bone, that the mother yearns for. The two acts collapse into each other, becoming purely physical for the speaker, "a love like cutting a white / onion, my eyes shining with tears I endure and write." This collection further acknowledges that bodily familial ties go beyond mother and daughter, and also extend to grandmother and great-grandmother. The physical and emotional scars of their lives and deaths are passed down as bodily impressions that manifest in younger generations. In "Fasting," the speaker claims, "I hold my mother in my body." The speaker must learn to bear these burdens passed on to her. She takes to this task by communing with the dead through poetry. In "How to Talk to Your Dead Mother," the poem becomes the medium of communication, which, initially, is familiar yet haunting. The mother is described as "now one who / returns trailing celestial afterbirth, a sort of innocence," but who needs to return to the realm of the dead rather than the living. After their conversation, the speaker realizes she must "teach your / child to nest where it’s warm, tell your dead to head / toward whatever window is full of light." The struggles of familial grief and pain, of childbirth breaking bodies, culminates in the lyrical and jagged-lined "Unwinged," which chronicles the speaker’s grandmother’s refusal to give birth as she tries to push her child back inside her: "Her bloody / broken-out-of-ness / held at bay by order—so, so / the importance of rituals." The speaker is tasked with remembering these moments of trauma, doing her best to render it through her own act of writing the poem itself. Rollender tackles desire and grief as manifested through the female form, those connections between the otherworldly and the actual physical body able to reproduce and heal, although imperfectly. The tension between the women made of light and the women made of bone produce poems full of the need to create a different version of familial history, engraving these women’s memories within poems. And throughout the collection this sentiment carries through: the best thing to be done is to keep close those relationships with the living and the dead, while not letting them consume us whole. Rollender produces work that is haunting yet accessible, a reminder of pain and perseverance through motherhood. Alyse Bensel’s poems have most recently appeared or are forthcoming in The Adroit Journal, Zone 3, burntdistrict, Heron Tree, Bone Bouquet, and elsewhere. She is the author of the poetry chapbooks Not of Their Own Making and Shift and serves as the Book Reviews Editor at The Los Angeles Review. A PhD candidate in creative writing at the University of Kansas, she lives in Lawrence.